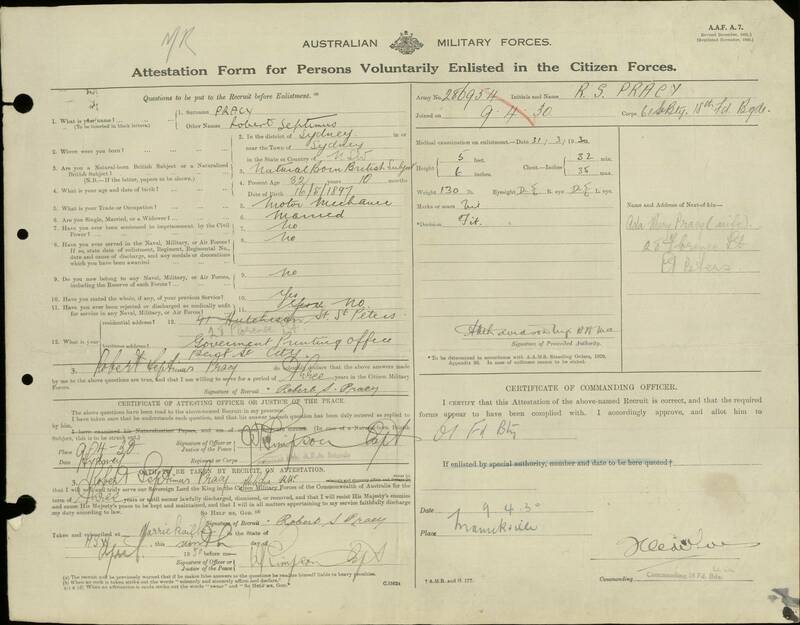 Status: Located; Extract of Personal details of Percy Griffiths as they appear on the Australian Imperial Force Nominal Roll. 1030 George Washington Muir, Sergeant age 24, 7th Infantry Brigade, 26th Infantry Battalion, "D" Company. Embarked 29 June 1915 at Brisbane on A60 H.M.A.T. Aeneas for Gallipoli. 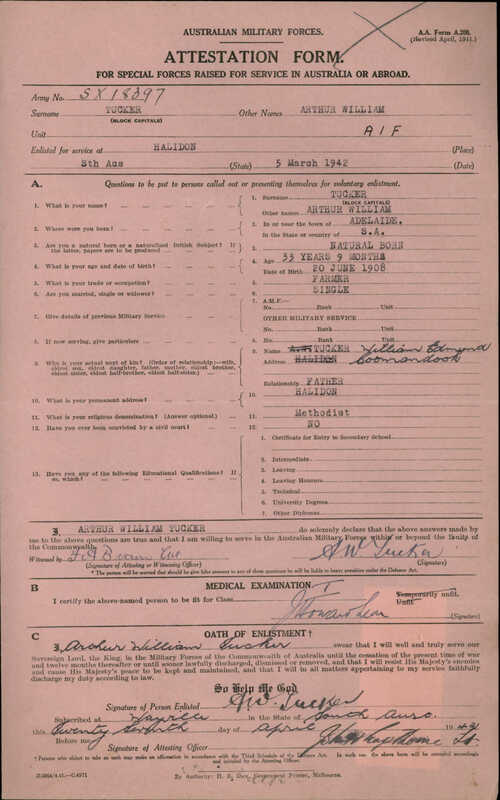 This is the official Australian Military Service Record of Henry Cecil Greene. He served Australian Imperial Force in France until he was killed in action during World War One. 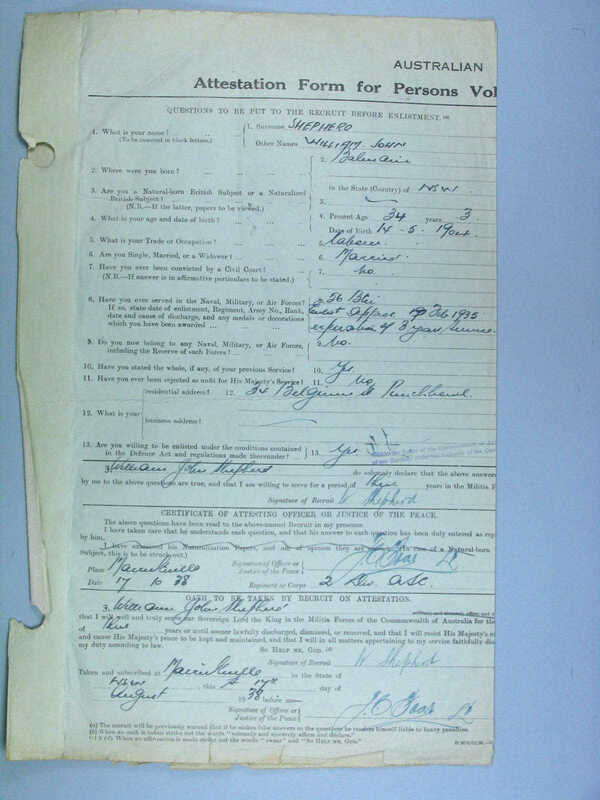 Australian Red Cross Society Wounded and Missing Enquiry bureau Files, 1914-18 War 1DRL/0428. The 26th Battalion was raised at Enoggera, Queensland, in April 1915 from recruits enlisted in Queensland and Tasmania, and formed part of the 7th Brigade. It left Australia in July, and, after training in Egypt, landed at Gallipoli on 12 September. At Gallipoli, the 26th played a purely defensive role and at various times was responsible for the defence of Courtney’s and Steele’s Posts, and Russell’s Top. It withdrew from the peninsula on 12 December. Douglas Francis Mottley Smith's name is located at panel 24 in the Commemorative area at the Australian War memorial and is indicated by the poppy on the plan. Transcription of the Banns of Marriage between John Duffield and Lydia Bidgood, publish at St Mary Arches church, Exeter, Devon, England on 10 August 1794, 17 August 1794 and 24 August 1794. Agnes Griffiths b 19th September 1834, Baptised 15th March 1835, St Johns Anglican Church, Launceston, Tasmania. RGD 32/2 Baptisms 1833 - 1838, Reg No. 6419. Amelia was born 16 January 1828 at Norfolk Plains, Tasmania and was Baptised at St Johns Anglican Church, Launceston, Tasmania on 23rd March 1828. Baptism Details - RGD 32/1 - Registration No.2469 - Ann Griffiths born 18 may 1826 at Norfolk, Tasmania, Australia, Baptised 18 March 1827, St Johns Anglican Church, Launceston, Tasmania. Ann Tucker born 1776, Baptised 10 Feb 1776, St Andrews Church, Wanborough, Wiltshire, England - Father James, Mother Jane. Arthur John Thomas Willcock baptised 09 October 1895 in the parish of Wrexham in the county of Denbigh, Wales. Bridget Kennedy was Baptised 29 October 1846 at Catholic Church, O'Callaghan's Mills, County of Clare, Ireland, in the Dioceses of Killaloe. Catholic Parish Registers at the National Library of Ireland, Microfilm 02476/08/page 50 - O'Callaghan's Mills. Charles Alfred Clancy born 20 December 1899, baptised 9 February 1900, St Saviour, Anglican Church, Redfern, New South Wales, Australia. Charles Tucker was baptised at All Saints Church, Liddington, Wiltshire, England, 12th August 1882. Edmond Tucker born 23 March 1812, Baptised 12 April 1812, All Saints, Liddington, Wiltshire, England. Eliza Griffiths born 5th April 1837, Baptised 12 July 1837, St Johns Anglican Church, Launceston, Tasmania - Registration number 7946, Registration Year 1837, RGD 32/2 Baptisms. Herbert James Pracy and Robert Septimus Pracy were baptised 03 June 1898 at St Saviour, Anglican Church, Redfern, New South Wales, Australia. Honora was baptised at St Caimins Catholic Church, Mountshannon, Galway, Ireland (now part of County Clare) on 22 December 1871. This is a copy of the Catholic Parish Record of Mountshannon (Clonrush) Baptism records. John Griffiths b. 2 Aug 1840 and his brother Frederick Griffiths b. 17 Feb 1842 were baptised 30 mar 1842 at St Johns Anglican Church, Launceston, Tasmania Ref: RGD 32/3 Baptisms No. 1350 and 1351. John Tucker born 1784, baptised 07 Sep 1784, St Andrews Church, Wanborough, Wiltshire, England. Mary Tucker born 1777, baptised St Andrews Church, Wanborough, Wiltshire, England. Ruby Dorothy Kathleen Longfield,baptised 2nd July 1891, St Matthews Anglican Church, Botany, New South Wales, Australia. Father Mountiford James Longfield, Mother Abigail Celeste Longfield.